Data Everywhere currently supports feeds that are automatically generated and updated by a Salesforce Report (only tabular data supported), which can then be shared through Google Sheets or Excel through our add-in programs. This process should take 10 minutes or less. If you prefer, contact support@dataeverywhere.com and we can walk you through the set-up. Please note that you must be a Salesforce Admin to complete the setup process. To connect with Salesforce, we require API access, which is available to Salesforce Enterprise Edition and Developer Edition customers. Professional Edition customers can contact Salesforce to enable API access for their account. Data Everywhere uses OAuth 2.0 to connect to Salesforce. Oauth is a secure way of giving access to your account in one system to your account in another. You will never share your Salesforce username or password with Data Everywhere. Instead, Data Everywhere will redirect you to Salesforce, where you will login and authorize Data Everywhere. If at any point you would like to revoke access, you may simply delete the connection in Salesforce, and Data Everywhere will no longer have access. Each organization within Salesforce (i.e your company!) must set up a "Connected App" for Data Everywhere to allow Oauth to work. You must be an Admin in Salesforce to do this. Next, scroll down and click "Create" on the left-hand navigation bar. Next, scroll down and click "New" in the "Connected Apps" section. and click the "Add" button to move them from the left pane to the right pane. You may have to click the button once for each of the two options. Make sure the screen looks like the image below when you're done. Then scroll down to the bottom of the page and click "Save"
You will now be on the main "Data Everywhere" connected app page. You will need two values from this page when you configure your Salesforce connection from Data Everywhere, the "Consumer Key" and the "Consumer Secret". Click the "Click to reveal" link to copy the "Consumer Secret". Now, you need to tell Data Everywhere about your Salesforce organization. First, go to https://www.dataeverywhere.com/external_connections and click "Add a new External Connection"
Then, choose "salesforce" as the service, and paste your "Consumer Key" from Salesforce into the "Client ID" field, and your "Consumer Secret" from Salesforce into the "Client Secret" field, and click "Save". 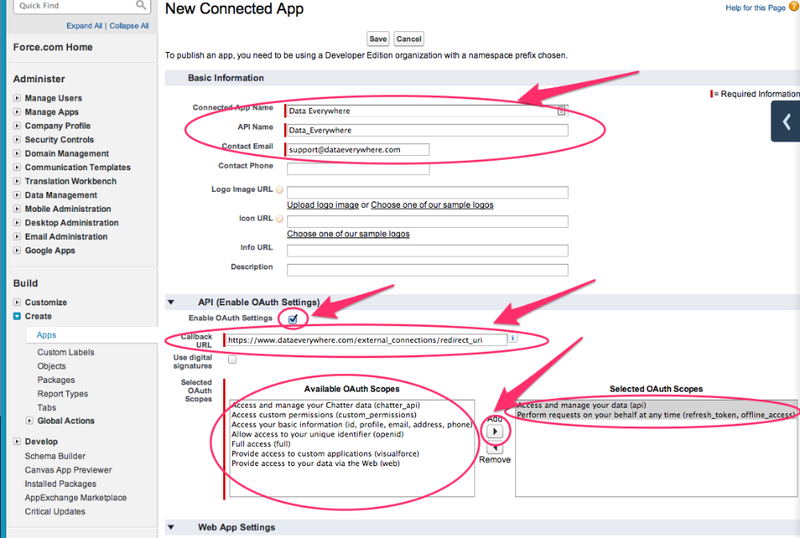 Now, you need to authorize a specific Salesforce account for Data Everywhere to use. Click "Authorize". This will ask you to login to Salesforce if you're not already logged in. Login, and then click on "Allow". You should be redirected back to Data Everywhere, and see that you are successfully authorized. After you have added Data Everywhere as a Connected App in Salesforce and then as an External Connection in Data Everywhere, you can now start creating Feeds by the Salesforce Report ID. Once configured, your Data Everywhere feed will check your Salesforce report for changes 3 times per hour, and will create a new revision whenever it changes. First, go to Salesforce, and click on "Reports." These feeds are now available for you in the Google Sheets Add-on or Excel Add-in programs!